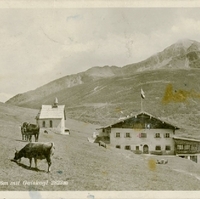 A postcard depicting a hunting lodge and chapel at Kühtai, a mountain pass in the Austrian Alps, in front of the Gaiskogl mountain in Tyrol, Austria. Built in 1622, it became a haven for skiiers around 1909, when the sport became popular. Originally published by Tiroler Kunstverlag: Chizzali. “Kühtai with Gaiskogl Postcard.” RICHES of Central Florida accessed April 21, 2019, https://richesmi.cah.ucf.edu/omeka/items/show/6663.